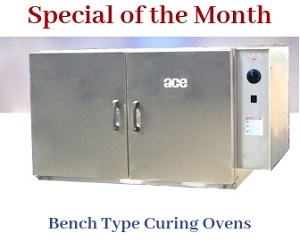 The ACE Model 3704-RT burn off oven is a highly efficient pyrolysis system. The system is generally used for removing additives, paint, and other contaminants from metal parts. The model is accepted across several industrial sectors due to its beneficial features. The oven features the optional One Touch Control (OTC), as well as the automatic shut-off systems. This makes the oven operation effortless and user-friendly. The normal cycle time required for the oven to remove organic materials from metallic structures is 2 to 8 hours. Since this oven operates at high temperatures, you can be assured of efficient and cost-effective cleaning, and de-coating of different parts. One can understand more about the oven from the below provided technical specifications tables. Volume Over Cart 682 CU. FT.
4 Top Mounted Pressure Relief Hatches 54.49 SQ. FT. The ingenious design of the oven ensures that the heat treatment of a component does not affect its mechanical process in any way. Besides, the oven intelligently monitors the development of any harmful gases, and eliminates them with the help of the primary afterburner.